8 Things We Love About Brisbane! In case you couldn’t tell, we heart Brisbane. Like, really love Brisbane. We’ve teamed up with Personalised Plates Queensland’s new I ❤ Plates to share this reminder of why Brisbane just rocks. Despite our infatuation for Brisbane knowing no bounds, we somehow managed to squeeze our long list of things we love about Brisbane into 8 measly little points. We heart Brisbane’s food scene big time. We’re the only place you can legit eat fresh Moreton Bay Bugs, that means it’s totally acceptable to hit up Jellyfish for the ½ kg bugs more than once a week. Plus, we all know our breakfast is on a whole other level and will have Southerners wishing they called BNE home. Plus, it’s totally easy waking up for brekkie when it’s not freezing outside #justsaying. Brisbane has matured into one of Australia’s cultural hubs, minus the pretentious vibes. QPAC puts on a damn good show; Queensland Ballet’s productions are world-class and show off just how talented we Brisbanites are. Plus, GOMA is home to not only breathtaking and thought-provoking pieces of art, the venue itself is also a work of art: it’s stunning. Did we mention Brisbane is the birth place of a long list of talented folk who are quite frankly killing it: Powder Finger, Savage Garden, Sheppard, Barry and Miranda Otto… do we need to continue? We have a pretty stellar lineup of parks in Brisbane. There’s nothing better than basking in the glory that is New Farm Park with a picnic blanket, a bottle(s) of Qld wine and your best friends. Plus Mt Coot-tha Botanical Gardens are so stunning they’re the perfect place to spend your weekends soaking up Brisbane’s eternal sunshine. From Oreo Crusted Unicorn Pies at Chester Street Bakery to Strawberry Sundaes at the Ekka, it’s safe to say Brisbane is well and truly killing it in the dessert game. Cowch’s Naked Pops, Ice Cream Sandwiches at Mister Fitz and the Honey Puffs at Greek on Cav…should we continue or are you totally with us already? 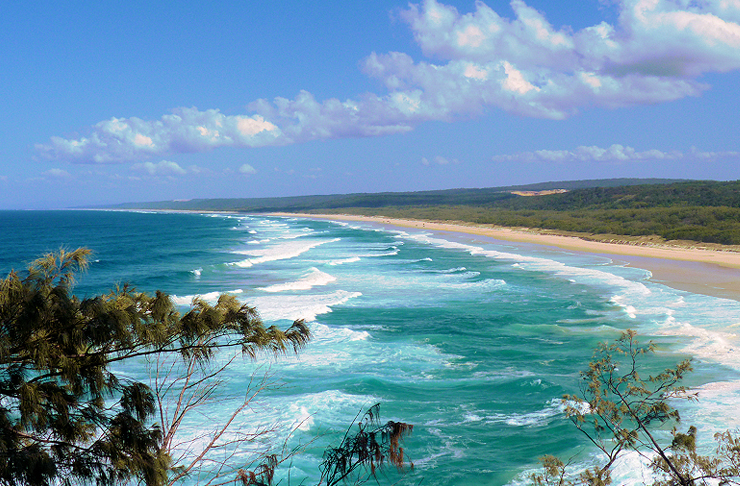 The Great Barrier Reef, Straddie, wineries, the Big Pineapple… all these Aussie landmarks are a stone’s throw away. Unlike Sydney, you won’t spend more time crawling through traffic on your way to a beach that’s actually in the city to be unable to find a spot on the beach and have to head right on back home. Nah-uh, none of that in Brisbane. Brisbane is home to pretty much an eternal summer. That means beach days, BBQs, thongs and t-shirts are acceptable all year round. Ok, maybe not thongs. Chapped lips, freezing cold mornings and grey, drizzly days just aren’t a thing in Brisbane. And despite our lack of daylight savings, our days are pretty perfect as they are anyways. Brisbane is just plain pretty. Despite the fact that you may only notice this as you’re stuck in traffic on Coro drive with time to look out across the stunning Brisbane River, Brisbane has a lot to offer in the looks department. Head to pretty much any venue at Eagle Street Pier and you’ll be in awe of our city’s beauty as you gaze longingly at the Story Bridge and the Kangaroo Point Cliffs. *This point is very, very debatable.